The first ever Ghana Energy Awards to recognize outstanding contributions and achievements of industry players have been launched. The maiden awards also opened nominations for 20 categories and outlined entry procedures, rules and requirements for prospective individuals and institutions. 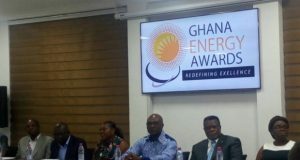 All nominations and supporting materials must be submitted electronically through the www.ghanaenergyawards.com’s online platform or via email at info@ghanaenergyawards.com, chairman of the Awarding Panel, Dr Kwame Ampofo said at the launch. Nominations will be closed on 30th September 2017 and grand finale taking place on 30th November 2017. Dr Ampofo, who is an Energy Expert and the immediate past Board chairman of the Energy Commission, enumerated the various procedures and rules governing the nominations and culminating into the final selection. The top four nominees will be shortlisted by the judging panel by 30 October 2017, one month prior to the awards ceremony on the Ghana Energy Awards website. Recipients of awards would not be declared and notified, he said, before the Ghana Energy Awards gala ceremony. The categories are divided into petroleum, and power sub-categories to differentiate between the two core industries. It includes: Chief Executive Officer of the Year; Industry Leadership Award; Emerging Energy Company of the Year. The Petroleum sub-category covers both upstream and downstream sectors. “We establish comparable factors and criteria that will allow us to judge both upstream and downstream nominees and rank them against each other in three categories,” Dr Ampofo said. “We additionally set up distinctive award categories that are solely reserved to the upstream and to the downstream sectors,” he added. They are Exploration and Production Company, BDC of the Year, Oil and Gas Marketing Company of the Year. Both public and private sector personality are considered while male and female recipients are awarded separately. CEO of the Year would go to a Chief Executive Officers or Managing Directors who through leadership and strategy have a significant impact on his or her organization. The rest are Industry Leadership Award; Emerging Energy Company of the year; Energy Institution of the year; Rising Star Award (individual); and Best Energy Reporter of the year awarded to outstanding journalist and media personnel. Others are Lifetime achievement award; Brand of the year; Exploration and Production Company of the year; BDC of the year; Oil and Gas Marketing Company of the year; Renewable company of the year; Corporate Social Responsibility Company of the year; and Innovation Project of the year. The rest are Best Local Content Compliance Company of the year; Energy Insurance Provider of the year; Energy Financial Provider of the year; Energy Consultancy Services Company of the year; Engineering and Construction.